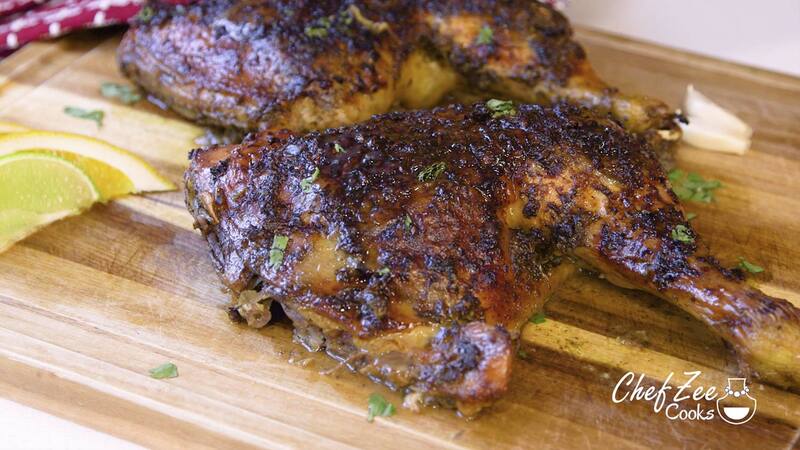 Pollo al Horno is a classic Baked Chicken Dish much like Rice and Beans. In fact, I think everyone should have a tried and trued Baked Chicken Recipe that they can rely on whether they love to cook or not! It’s a recipe that’s essential to your arsenal and can make even the most novice cooks look like professionals. Now I get it, baking anything whether it’s meat or sweets can be daunting but it’s honestly not as complicated as you think! Below I’ll share some quick tips that will have you roasting like a pro! 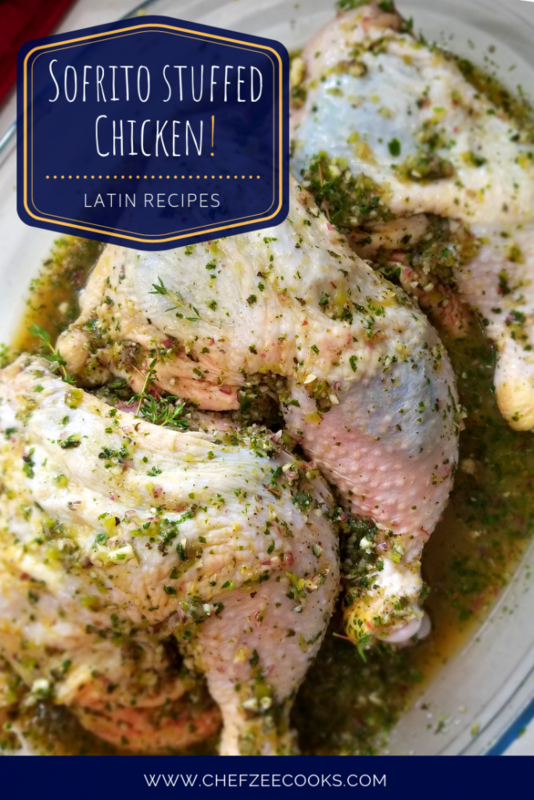 Before we begin, know that there are a million and one ways to baking chicken including making this Latin Staple- Pollo al Horno. I personally make it a variety of different ways. Sometimes I use the same Pernil Marinade to make Pollo Horno and other times I freestyle making a Honey Bourbon Chicken, Orange Rosemary Chicken, and many more. Today, I’m keeping it fresh yet simple by making a Sofrito Stuffed Chicken. Now if you’ve ever had Sofrito then you know that this homemade herbaceous sauce will instantly give your food amazing flavor. The freshness from the ingredients transforms it to something out of this world. It’s so good, that you can even make extra sofrito and use it as the base of many of your dishes whether you’re making Beans, Moro, or Veggies. Yes, it’s that versatile! The best part about Sofrito is that you can also freestyle it to your desire. You can add as much onions, peppers, and garlic as you like. You can infuse as much color and flavor as you like it as well. The beauty is that no two sofritos are alike and how you make it can change each and every single time. It really depends up to you. You can also choose to pre-season your sofrito. I go back and forth and it honestly depends on my mood and what I’m planning on using my sofrito for. If I’m going to use my sofrito to seasons meats then I’ll usually pre-season it and season my meat as well. If I plan on using my sofrito to mostly make veggies then I’ll typically skip the seasonings since veggies are already delicate. Lastly, you can also make sofrito on the fly, which is what I do ALL OF THE TIME! If you watch any of my YouTube Videos, then you know I make a deconstructed sofrito every time that I cook. I always opt for using fresh onions and peppers vs ground/powder versions unless I think it’s truly necessary. Baking Chicken isn’t too difficult either. I get questions all of the time from cooks who worry about whether or not the meat is done. Fear not because here are some tips to getting juicy and cooked chicken all of the time! Tip #1: Bake your chicken covered. Doing so helps keep in moisture and keeps your chicken juicy. Your chicken will cook all of the way through without drying up. It’s as though you’re creating a steam bag for your chicken! Also, don’t forget to Pin this yumminess to your Pinterest Boards! And now for the recipe! Enjoy with your favorite side dish, rice, beans, tostones and freshly squeezed lime! Feel free to leave cook the chicken with the skin or without the skin. If you opt to make the chicken without the skin, know that you can skip the last 15minutes of roasting since there is no skin to crisp up. 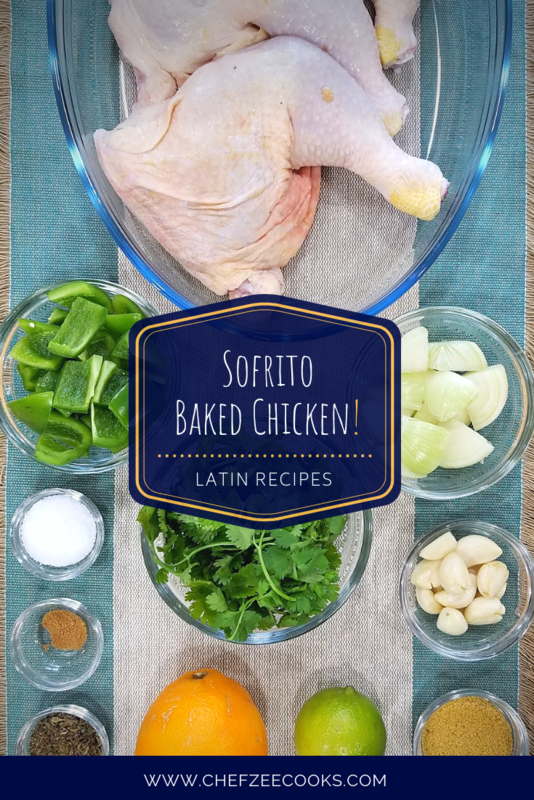 Also note that your chicken will cook much quicker and will require less sofrito seasoning. If you have left over sofrito seasoning, store in a glass container in the refrigerator.